Dylan* was 23 years old and had been going through phases of shedding every three or four months. This gradual loss had accelerated, becoming more noticeable over the past five months. In hope of avoiding the same fate as his brother, Dylan had tried all manner of shampoos and serums. But in the end, they were just empty, and expensive, promises. Between study and work, Dylan looked after himself physically and mentally. He enjoyed working out at the gym and managed the stress of juggling a busy life well. But despite his mind and body being in good shape, the appearance of his hair was of great concern to him. He had been wondering if treating his hair in a medical hair loss clinic was the right way to go for the past five months. It was an ad for Ashley and Martin on a website he was visiting prompted him to find out more; the medical nature of the program was encouraging. Finding out that his treatment would be under the care of doctors gave Dylan the confidence in Ashley and Martin he needed to go ahead and book a free consultation. Without telling anyone he was seeking treatment, Dylan visited Ashley and Martin to meet with a hair loss consultant. 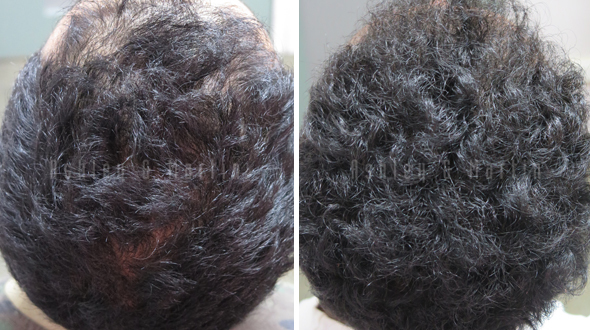 And after he was satisfied that the treatment was as genuine as it appeared online, he enrolled on a RealGROWTH® program under the care of the clinic’s hair loss doctor. He was happy to find that the medical aspect of the program was not a one off gimmick and that he would have access to the clinic doctor to discuss his treatment any time he needed to. With all his commitments, Dylan was unable to attend the clinic regularly for his laser therapy appointments, but he was mindful to adhere to every other aspect of his quick and easy nightly routine at home. He was especially concerned about the thinning through his frontal hair line and crown and was not going to give it a chance to get any worse. By the time he was sitting in front of his comparison photos at his first Ashley and Martin review, Dylan was happy he had chosen a clinic with proven medical results. He had come in thinking his hair was feeling thicker, and the photos in front of him were proof that his treatment was working.